At 6:00 a.m., when I'm assembling my breakfast English muffin, I don't need to deal with hard butter. This gizmo deals quite handily with the task. I now have soft, spreadable butter whenever I want it. Super, low-maintenance idea! Love, love, love it. Makes using soft butter the only way to go. It is attractive and dishwasher safe. Would like to see a double wide to hold two sticks of butter. Very handy. MUCH better than the dish I had!. Love that it opens without having to place the lid somewhere else on the counter (spreads the butter, plus takes up space on the countertop!) Love that it has it's own little knife AND A PLACE TO PUT IT - so countertop nor top of butter dish gets knife butter. I purchased a Butterie for myself last year because I wanted a red butter dish and I liked the idea that I didn’t have to set the lid on the table while I used it. Much to my surprise it hold two sticks of butter at one time so I don’t have hard butter because no one replaces it when it gets low because there is room for two sticks. My friends love it also so I have purchased two more so far as gifts. It is the best butter dish I have ever owned. I love using real butter, and this wonderful dish and spreader help keep my butter "spread-ready." Excellent product Love having soft butter for my bread and rolls. Easy to clean. I received this item very quickly & it was packaged well to prevent any damage. However, it is a gift for someone whose birthday hasn't happened yet. I like this unique & ingenious item very much. Only hope that the birthday person also likes it. He now keeps sticks of butter on the original wrapper which is placed on a small plate that's kept inside a convenient kitchen cabinet. I think this butter dish will keep his butter protected from dust, etc. and having a dedicated butter knife that stores in the dish will be handy. It may even mean that he will decide to keep this butter dish on the kitchen counter instead of in the cupboard? No more dropping the butter dish lid! Love the design, washability and appearance. Bought one for myself and three for gifts. I absolutely love having my butter softer and more spreadable. This was the perfect solution. Attractive and functional. Butterie™ creator Joelle Mertzel made her own countertop butter dish when she learned that butter doesn't have to go in the fridge, and that storing it at room temperature can enhance the flavor. 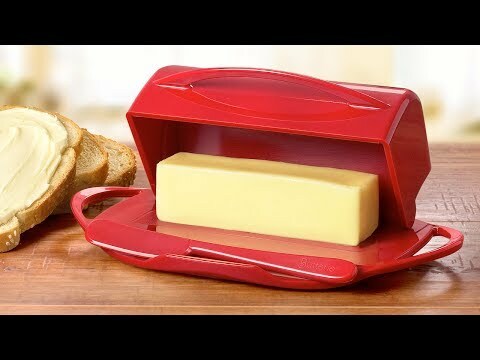 Before refrigerators existed, everyone kept their butter in a crock on the counter or in a cabinet. Joelle took that idea and improved upon it. Her dish has a flip-top lid that blocks light and reduces the butter’s exposure to oxygen, helping it stay fresh for longer.